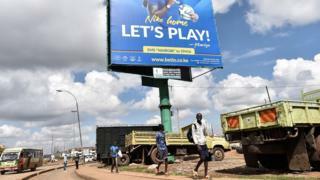 "I am a betting addict"
To deter Kenyans from becoming problem gamblers, the government has introduced some taxes - the first, which came into affect in January, means betting firms must hand over 35% of their profits. "We want to push tax on betting from 35% to 50% because they are ripping off our poor young Kenyan youth and repatriating [the money] overseas," MP Godfrey Osotsi said. "Gambling machines are everywhere. Betting is glamorised, our newspapers tell us daily about the winners and never about the losers." "Betting is a problem that needs to be tackled head on. It's all youth think about these days," the 53-year-old says. "The government should also ban advertising. These moves will see less people, especially children, exposed to betting." "The government should set up free counselling centres to help addicted youth.